We are a small cattery specializing only in Savannah cats in Las Vegas, NV. Over ten years ago, we became enamored with the purebred cat breeds. 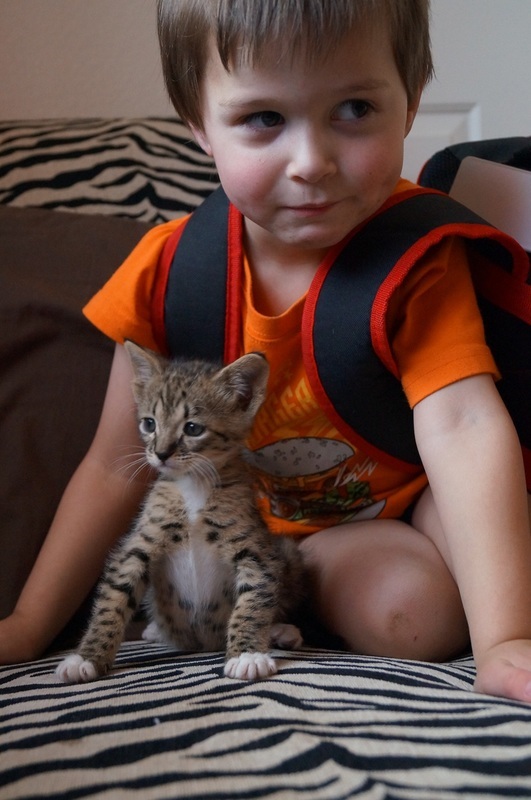 Starting with Sphynx, we were introduced to the Savannah cat and our love affair with the breed began. We have actively worked with the breed group in creating a breed standard as well as spent uncountable hours educating the general public about this fascinating breed of cat. We believe socialization is key to a great kitten. With 5 children-- ranging from an Air Force enlistee to an almost-kindergartner, there is always someone available to play, kiss, handle and hold our kittens. The kids are fully involved and committed to loving our Savannahs from the day they are born into our home. We also have three small dogs which assist in further socialization before our kittens head home. We are a LICENSED cattery in the state of Nevada and therefore, our home is inspected and our license renewed annually. Our veterinarian is the marvelous Dr. Jennifer Willey at Desert Inn Animal Hospital (702)-732-2210 and we recommend her to every new Savannah owner in the valley. Let them know AllEarz Savannah sent you and they'll take great care of you and your kitten! This is how we socialize-- lots of love, lots of playtime and kisses and handling. We love this breed and love educating others on Savannahs! Interested in learning more about Savannah cats? Message us today!